A court in Russia has sentenced a man to 28 days in jail for creating a fake gravestone of President Vladimir Putin. Activist Karim Yamadayev was sentenced on Tuesday in the city of Naberezhnye Chelny for a repeat violation of the law on holding public events. He said he was protesting against a bill on Russia's "sovereign internet", saying it threatened freedom of speech. On Wednesday, Russia passed two bills penalising disrespect of authorities and the spreading of fake news. The second bill prohibits sharing "false information of public interest, shared under the guise of fake news". Journalists, human rights campaigners and even Russian government ministers have voiced their opposition, with some speaking of a new "Iron Curtain" on the internet being put up by Russia. 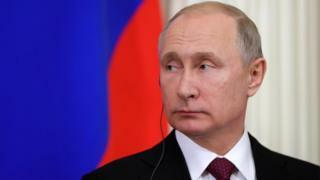 Under President Putin the Russian state has taken control of the major TV channels and other mainstream media, so opposition voices are mainly confined to social media. What happened in Naberezhnye Chelny's court? The court in the central city found Karim Yamadayev guilty of a second violation of the law regulating the staging of public events in Russia. The court mentioned that in January he had been prosecuted for setting up an improvised monument to the victims of political repressions in Russia. Karim Yamadayev denied all the accusations. His lawyer said Russia's constitution guaranteed freedom of speech to every citizen. On Tuesday, another man - who had helped him to put up the gravestone - was given a six-day detention by the court. What about the fake gravestone? It was set up on 10 March near the building housing the city's investigative committee. The black gravestone had a picture of President Putin and years of life 1952-2019. Russian opposition leader Alexey Navalny tweeted the picture of the gravestone, saying: "The dude, who made 'Putin's gravestone' has been given a 28-day detention. "The installation, in my opinion, is absolutely idiotic, but Russian laws do not penalise for stupid jokes. The arrest of this person is a crime. Real lawlessness."